(Nanowerk News) The origin of cosmic rays, high-energy particles from outer space constantly impacting on Earth, is among the most challenging open questions in astrophysics. 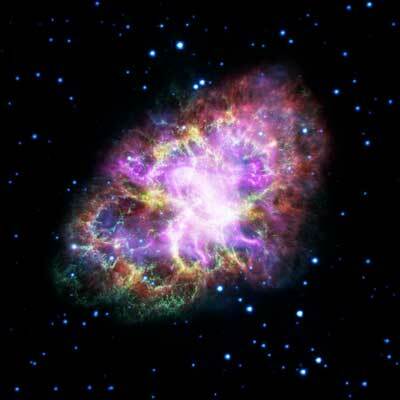 Now new research published in the journal Monthly Notices of the Royal Astronomical Society ("Particle acceleration model for the broadband baseline spectrum of the Crab nebula") sheds new light on the origin of those energetic particles. Discovered more than 100 years ago and considered a potential health risk to airplane crews and astronauts, cosmic rays are believed to be produced by shock waves -- for example, those resulting from supernova explosions. The most energetic cosmic rays streaking across the universe carry 10 to 100 million times the energy generated by particle colliders such as the Large Hadron Collider at CERN. According to the generally accepted model, once the particles reach a shock boundary, they bounce back and forth many times due to the magnetic turbulence. During this process they gain energy -- in a similar way to a tennis ball being bounced between two rackets that are steadily moving nearer to each other -- and are pushed closer and closer to the speed of light. Such a model follows an idea introduced by the Italian physicist Enrico Fermi in 1949.